When analysts refer to Fiat in South America, most of the time they are talking about Brazil, which became Fiat’s largest car market and Fiat-Chrysler’s second one. But even if Fiat’s presence in Latin-American is highly concentrated in Brazil (86% of LATAM sales), there is a second market where the group has an important share. It is Argentina, the second largest economy in South America, after Brazil. In recent years it has become a very important car market due to the big jump of domestic demand that pushed many auto makers to produce locally. That good mix of high demand and strong local production has made of Argentina a bigger market than Spain and very close to Mexican numbers, in terms of sales, and a very important car exporter. Since many years ago, Fiat has been an important player over there. That’s why it is now the biggest producer and has a good market share with a big range of products. More than 840.000 cars were sold last year in Argentina. Tha market is down 2% but it is still a big result only surpassed by Brazil and Mexico in LATAM. 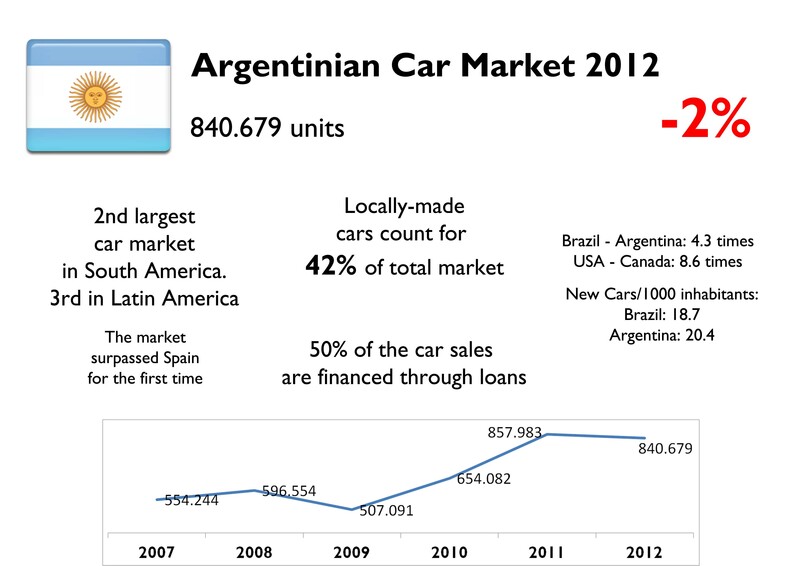 Argentina is for the first time in history a larger car market than Spain, which is considered a developed country. It is certainly a fast growing market but has some specific problems that may affect its future. Its spectacular growth may had already reached the top in 2011, with 850.000 cars, because economic situation in Argentina is getting a bit difficult due to inflation and currency problems. People continue to buy more cars but this trend may be a bit superficial. Current socialist government is focused on creating better conditions for local production, but at the same time is creating a bad scenario for future purchases coming from common buyers. The reason for this fake situation is based on two main facts: currency control and speculation coming from buyers, and the big share that credit has on total sales. Both of them must be closely analyzed to understand the reasons of the car boom and its future. Currently it is hard to make an investment portfolio in Argentina. There aren’t investment alternatives for people living there. Besides, inflation continues to grow, and the government has created several laws in order to control the currency in both ways: in and out of the country. That’s how for most Argentinians has become more difficult to go shopping in other countries, as they are allowed to spend a specific amount of money and they can’t buy as much as dollars they want. So for some of them, the only option is to buy a new car. This would not be a problem if it wasn’t because of currency speculation. According to Autoblog Argentina, there were some months of 2012, when part of the demand came from people speculating with the exchange Peso-Dollar. Dealers sell cars in pesos calculating the price with official exchange. But there are two different exchange rate for the Dollar: the official one, and the illegal one. Those having dollars at home could sell them in black market (illegal one) and could have earn from the difference there is between the two exchanges. In one month, the price of the car wouldn’t change but the difference between the two exchange rates could benefit the buyer if the illegal one rises during that month. It means that at the end of the month the car would have the same price in Pesos but would be much cheaper in dollars. Therefore the buyer could save money when buying a new car, and that could explain part of the boom in Argentina. The second situation comes from the fact that half of Argentinian new car sales make use of credit. Considering that some people buy new cars looking to offset inflation, part of those credits could have some origins in that common belief. That’s why part of the boom is explained by some economic imperfections that may not last forever. However it is difficult to know how much of total sales come from this kind of activities. The problem is that new cars have become an investment asset that makes part of an economy controlled by a socialist government and composed by buyers that maybe don’t really need a car. Going back to 2012 results, the market is very well-balanced in terms of share composition by car makers, at least in the first 5 places. Actually the top 5 best-selling brands sold 71% of total sales. VW leads the market with 19.5% share, but is not far from second place. Regarding auto groups, VW Group leads also with 20.6% of the market, and is followed by GM, Renault, PSA, Ford and Fiat-Chrysler, all of them with shares between 16% and 11%. It means that the market is quite opened to all types of offer and all car makers have a chance to sell. It also means that competition is really hard. As it happens in Brazil the market is more opened to local production than imports. Thus, some important car makers that don’t produce in the country have very low share: Hyundai, BMW or Mercedes. Compared to 2011 figures, Renault is the best performer of the big 6, up 13% and with almost 2 more basic points in share. 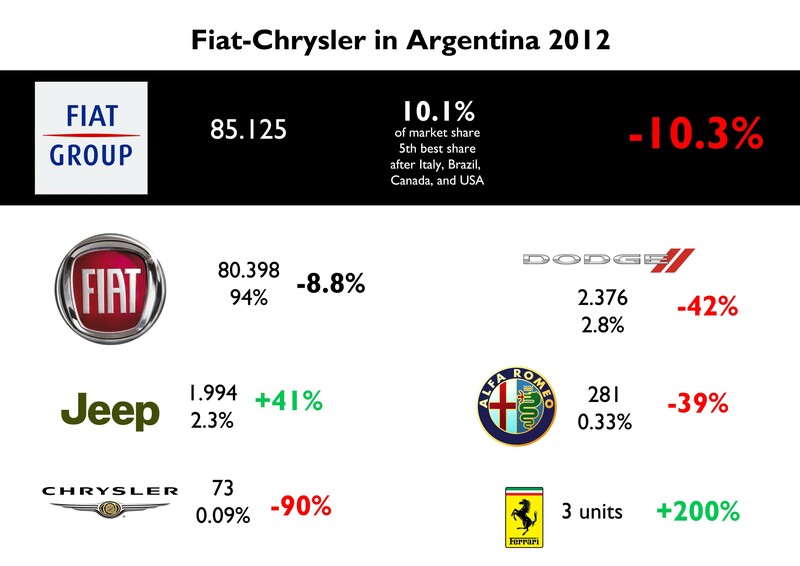 Fiat Group lost its 5th position and was surpassed by PSA by few units. Consumers mostly prefer small cars, B-Segment, which count for 39% of the market. A big part of them are locally produced while others come from Brazil and Mexico mainly. Contrary to Brazil’s composition, the second largest segment is not the ‘A’ one. Compact cars, C-Segment, are more popular and count for 14% of total sales. They are closely followed by city cars. A, B, and C segments count for 64% of the market (in Brazil they have 72% of quota). Pickups are also popular in Argentina, but not the same of Brazil. Mid-size pickups, C-Pickup, are the most popular as they count for 79%, against 21% for small pickups. One of the reasons for this difference with Brazil is that mid-size pickups are built-in Argentina, and small ones in Brazil. SUVs and MPVs are still far from leading the market. Their low sales are explained by the fact that most of the offer is imported from countries outside the MERCOSUR trade area, so they are very expensive. Actually there is only one SUV and one MPV built locally (Toyota SW4 and VW Suran). 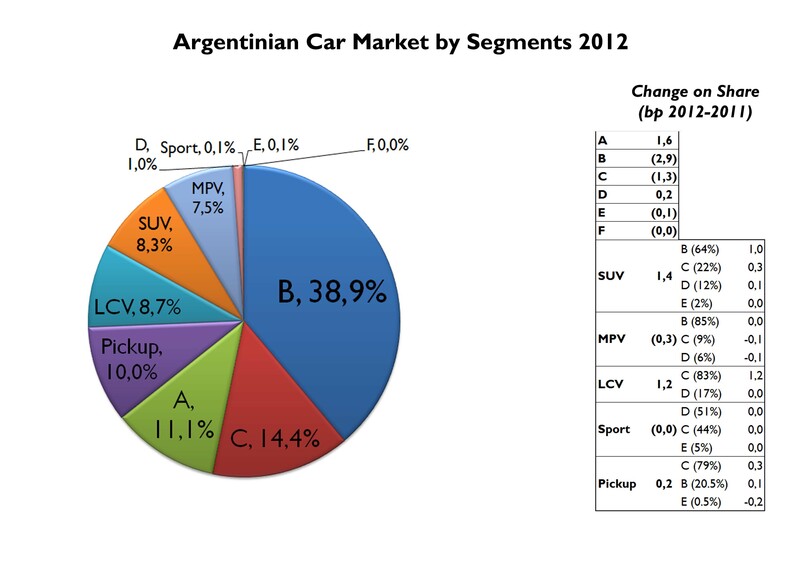 Compared to 2011 results, the segmentation changed a lot: B-Segment cars lost 2.9 basis points, followed by C-Segment. The fall in their share is explained by more share coming from city cars, up 1.6 basis points. SUV’s share did also grow, mainly because of small ones. At the end, Argentinian and Brazilian markets are more or less like the relationship there is between Canada and USA. They are similar markets but they had specific differences in terms of segmentation. The group plays an important role in Argentina. It is not the best-seller because there are 5 groups ahead, but its share is not far from them. 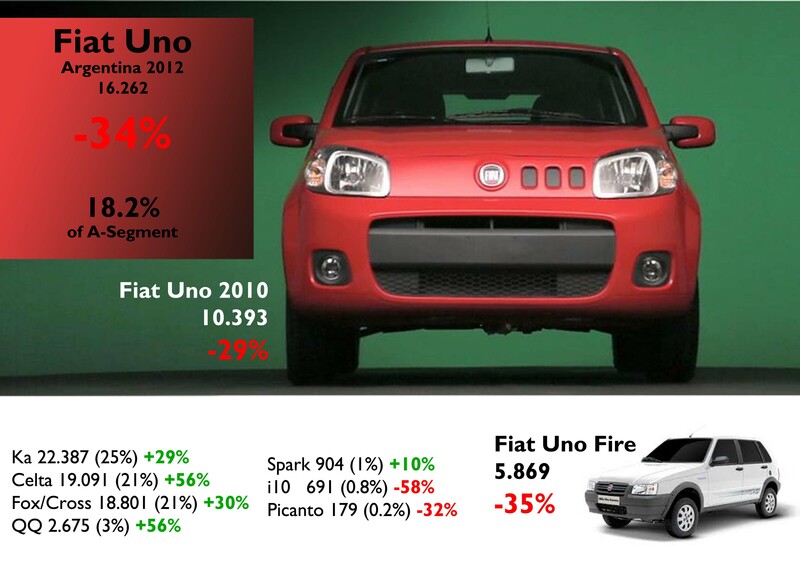 But Fiat is also important because is becoming (since November 2012) the largest car producer. 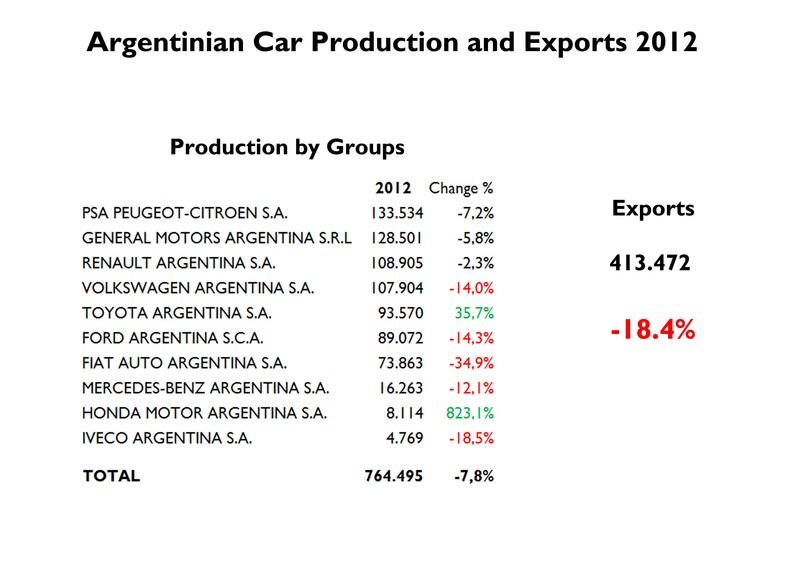 Thanks to MERCOSUR trading rules, Argentina has become the place to produce cars to be sold there but also in Brazil. Some of the car makers established in Brazil are running out of capacity, so they have decided to use their Argentinian factories to supply both markets. Fiat builds the Siena and Palio in Argentina in order to help the Brazilian factory with the strong demand in both sides of the border. That’s how the group produced 74.000 units last year, and sold 91.600 units (Iveco included). Is hard to know how many units of those units produced locally stayed in Argentina, but what is clear is that most of the production is sold in Brazil. In 2012 group’s sales are down 5% (Iveco included), and 10% without Iveco. It had the biggest fall among the top 6 and this is partly explained by the fall of Uno’s registrations and the performance of the Siena, which got its new generation in the last months of the year. However the group’s share is above 10% mark, which is better than in any other European market. Argentina could be the market with the wider range of products of the group. Fiat brand, Alfa Romeo, Dodge, Jeep, Ferrari and Chrysler are present with so many models coming from Brazil, Mexico, USA, Canada, Italy and Turkey. Fiat brand counts for 94% of the group’s sales, but Jeep made a good job growing 41%. In the opposite side there is Alfa Romeo, that had a good start but now faces tough times due to the lack of new cars. The group sales composition by segment is pretty similar to total market’s. 40% of total sales correspond to B-Segment, followed by 25% for A-Segment. Then comes the LCVs, which are very popular in Argentina. 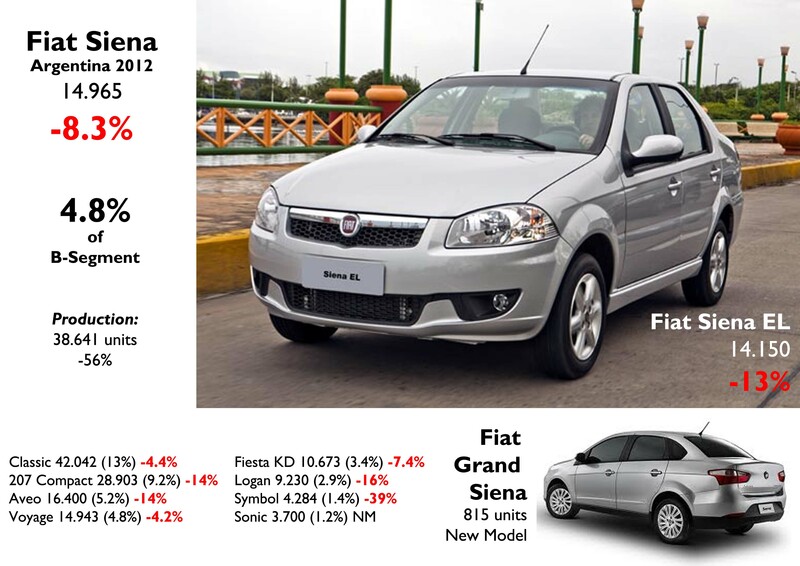 Fiat introduced the Italian Bravo in the second semester of 2012, so C-segment share is still very low. Regarding the position of the group in each segment, the Palio/Siena/Punto make a wonderful job in B-Segment, allowing the group to catch 11% of it. The Uno and 500 own 24% of A-Segment, which is also fantastic. 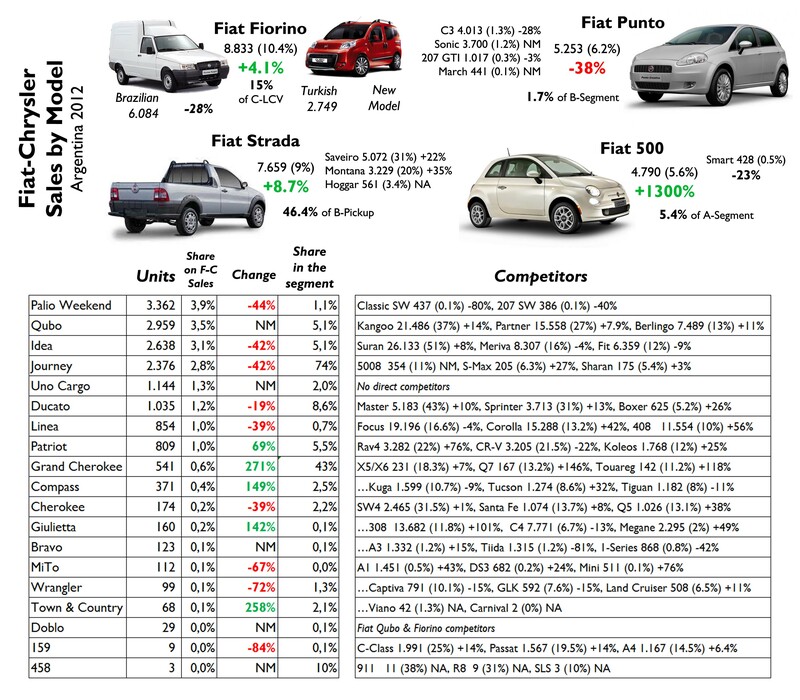 The same result in LCV, and interesting shares in Pickup and MPV segments. 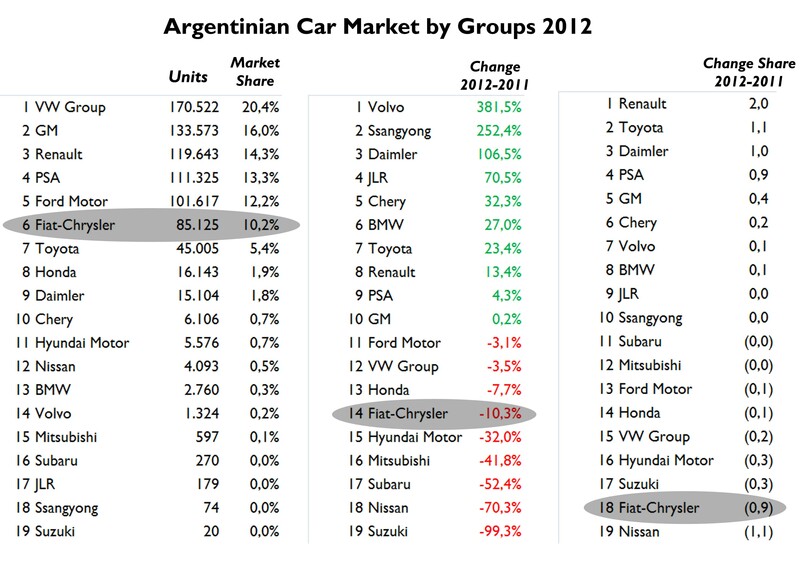 However the group’s total share isn’t bigger because of the poor result in Argentina’s second largest segment: ‘C’. The Linea is not popular at all and the Bravo just arrived, while the Giulietta is very expensive to add volume. Therefore the group owns only 1% of that important segment. The best-selling name plate is the Uno, which includes the old and new generation. 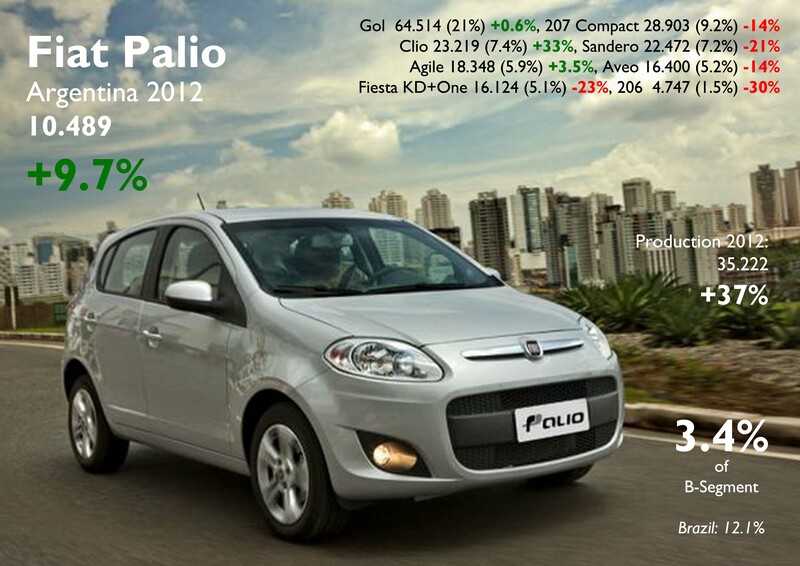 Both of them count for 19% of the group’s sales, but it seems they will lose the pole position as the Siena and Palio had better performance in the last months of the year. Thus, the old and new generation of the Siena occupies second place with 17.6% of total sales, while the Palio (old and new generation) follows with 12.3%. The new generations of Palio/Siena are having great success in Argentina, due to the fact that they are also locally produced. After them there is also another successful model: the Fiorino. Fiat sells two different models with the same nameplate: the old Fiorino based on the old Fiat Uno, and the European Fiorino, imported from Turkey. Their combined sales counted for 10.4% of the group’s sales. Other important models include the Strada, Punto, and 500, which had a wonderful year, no matter its price. Argentina is the most difficult market to forecast. Due to several regulations, the market is becoming a bit fake in terms of volume, but is hard to know what percentage of it comes from speculation purchases. Actually the market is very unstable month after month, so making a forecast for 2013 is a hard job. Nevertheless, I think the economic situation in this country will have some problems in 2013 as inflation will become a big problem and currency regulations will affect exports. That’s how total sales may decline around 10%-15% in 2013 to 715.000-750.000 cars. This may be my worst forecast as I repeat is really hard to determine whether current boom will continue or not. Unfortunately, the auto industry is highly regulated by government and this makes it vulnerable to macro economic issues. Besides, if part of the industry is based on speculation activities, then something will not work in the future. 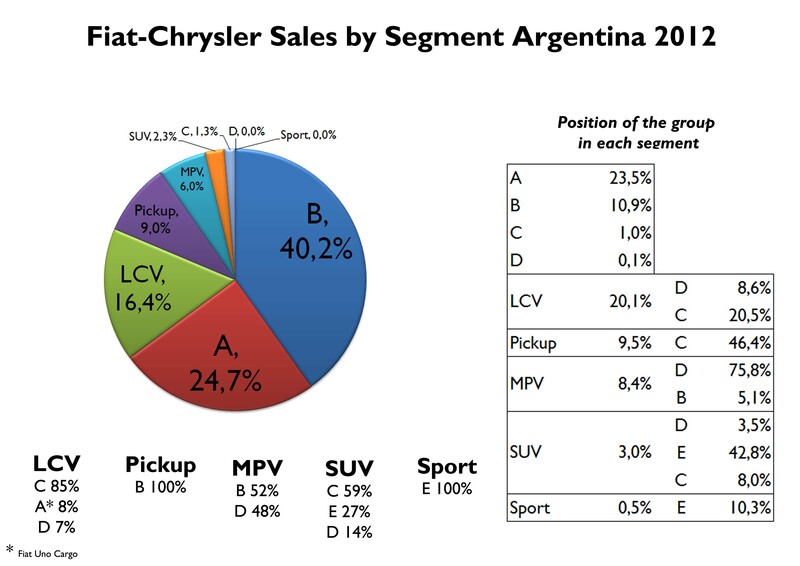 Based on Fiat Auto Argentina plans, the company along with Jeep and Dodge, could sell around 80.000-90.000 units this year taking into account several facts. The first one is that new Palio/Siena will continue to grow in the ranking allowing the group to offset the fall of the Uno and Strada. Second, the new Punto is expected to take off in short-term, so this would balance the fall coming from the Idea and Palio Weekend. Other brands of the group are not expected to have big jumps as they will continue to import their cars.